In the present times, whether B2B or B2C market, lead generation sources are many and are not limited to a single touchpoint. Sales organizations are wholly dependent upon the leads to sustain profitable operations. In this write-up, I will be covering 10 ideal ways to generate sales leads in business. This article is focused on targeting inbound, and outbound leads using some of the proven strategies. 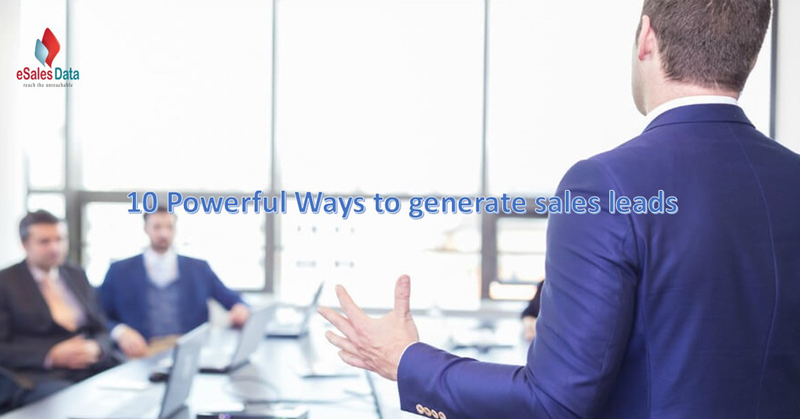 You can leverage these ideas to increase your sales volume whether it is IT-Sales Leads, technology sales leads, Real Estate Sales Leads, or more. Landing pages serve a particular purpose to assist visitors who arrive on the website in search of the solution. A typical landing page may represent offers, forms, trials, and more. It is recommended to place landing pages within your servers so that the traffic from outbound campaigns is not diverted to facilitators. If you are setting up landing pages on third party sources, you may never receipt the benefits of SEO optimizations because your campaigns may dilate the SEO rankings of the facilitators alone. Webinars are soon becoming part and parcel of B2B engagements because it lets the presenters engage with customers by discussing subjects that provide technical insight on niche challenges. Webinars are executed with visually appealing slides with rich information or as an interview based presentation. Blogs are an excellent source of traffic generation. Information rich write-ups can attract the relevant audience by providing value to people that consume information for addressing the challenges. If you can produce high-quality content with lead-magnet properties, it can be promoted on other websites that are willing to provide backlinks. Whitepaper calls the attention of technical minds into report based content that will guide marketers out of the particular set of challenges. A white paper is crafted with the intent to serve the audience with rich technical know-how by breaking down a challenge to its fundamental state and outlining the steps that can lead to successful outcome. It is proven that existing customers can bring more value to the business because happy customers stay loyal and it takes little efforts for marketers to keep old customers connected while it costs time and money to prepare a new audience for conversion. Nurturing the relationship with old customers can incentivize your progress in the long run because not only do they return for repeat business but they can influence their peers to become your customers. Often, lead generation is oversimplified because it is wrongly interpreted as a run of the mill job to find people to buy your products and services. Many companies continue to thrive off on the momentum generated by inbound source alone. An effective method of lead generation is to have multiple sources of where marketers can continuously tap should the other source run dry. In the last 30 years, innovation in B2B lead generation progressed at crawling speeds until the more recent influence of Big Data. It has drastically transformed the marketer’s quest for finding new customers. Copyright © 2008-2019 eSalesData LLC - All Rights Reserved.